It takes more than one pair of hands to successfully operate a farm or a sawmill. 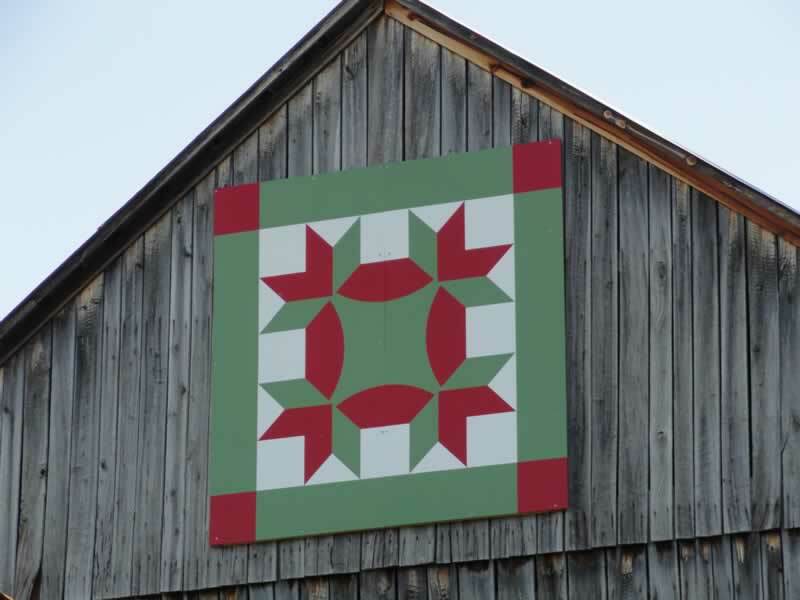 "Hands All Around" is the quilt pattern chosen for the barn at the Shives farm by 4th generation owners Bill & Paula Shives. First generation owners Daniel & Delilah Shives purchased the farm in 1896. In 1919, it was acquired by son, Abner and his wife, Helen Shives. The farm continued ownership in the family with grandson, A. Reed "Pete" & wife, Dorothy Shives acquiring the farm in 1948 and great-grandson, Bill & wife, Paula Shives acquiring the farm in 2001. Through the generations, the Shives families made their living, at some point in their lives, by either farming and/or sawmilling. The Frick sawmill previously operated by Bill with a 'helping hand' from Paula doing the off-bearing, is still located on the farm. During the summer months, their son, Matt, the 5th generation, assisted with the sawmill business. The barn, believed to be constructed in the 1800’s, has hand hewn logs held together with wooden pegs. Portions of the stone foundation gave way in the spring of 2016. Knowing the history, it was important to Bill & Paula to preserve the barn. Amish builders raised the barn. With the assistance of Bill and Matt Shives, the old stone foundation was removed. A new concrete foundation was poured and the barn replaced on its original site. A come-a-long was used to straighten a bow out of the barn front. This barn is now sustained for future generations of the Shives family.